Here's one annoyance about Windows 7: It doesn't remember the position of your Windows Explorer windows after you close them. Here's the fix: ShellFolderFix. This simple-to-use free utility will remember the position of all of your Windows Explorer windows. Once you install it and set its options to your liking, you'll never need to do anything else. It simply remembers where your windows were, and starts them in that position when you reopen them. I've found that it also remembers the position of windows in other applications as well. 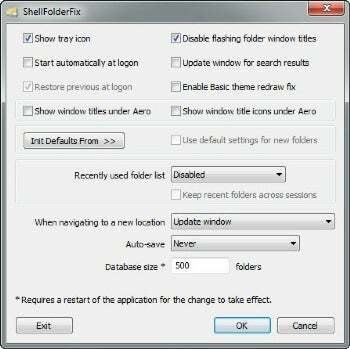 ShellFolderFix remembers the position of your Windows Explorer windows--and perhaps other windows--after you close them. ShellFolderFix promises to perform other tasks, such as saving a workspace of your open windows which you can later reopen, but I was unable to get that to work properly. And I found that it had a minor issue with saving the position of Firefox windows--if a Firefox window was partially off-screen, it would not restore it to that off-screen location after re-starting Firefox. But these are minor quibbles. If you want Windows 7 to remember the position of your windows after you close them, this nifty little freebie will do it for you.